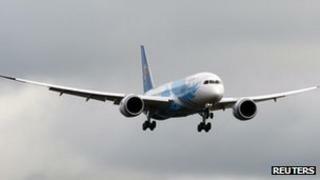 Boeing has said that a test flight to check the 787 Dreamliner's new battery system "went according to plan". Boeing redesigned its battery after malfunctions on some planes led to the grounding of the entire 787 fleet. The firm said it would analyse the data and prepare for another test flight aimed at demonstrating the system to regulators in "coming days". According to some estimates, Boeing is losing $50m (£33m) per week because of the grounding of the 787 planes. The grounding has also led to Boeing being prevented from delivering new Dreamliners to customers. The Dreamliner 787 is the first plane in the world to use the lithium-ion batteries, which are lighter, hold more power and recharge more quickly. But incidents relating to battery malfunction earlier this year raised some concerns over its safety and led to the grounding of the fleet. In January, a fire started in a battery pack in a Japan Airlines 787 in Boston. Meanwhile, an All Nippon Airways flight was forced to make an emergency landing because of a battery malfunction. Boeing has since submitted a plan to the authorities to redesign the battery to ensure its safety. Its plan includes improving the battery design to stop faults from occurring as well as enhancing the production, operating and testing processes. At the same time, Boeing said the plan included a new battery enclosure system to prevent any possible overheating from affecting the plane. Some analysts said that the redesign was likely to help address the concerns surrounding the battery. "I will give the Boeing engineers the benefit of the doubt that they have designed a box that will handle what the battery can give it," said John Goglia, a former board member of the US National Transport Safety Board (NTSB). The battery redesign plan was approved by the US Federal Aviation Administration (FAA) earlier this month. But the regulator had told Boeing to "conduct extensive testing and analysis". Earlier this month, Boeing executives had said that they expect to restart commercial flights of the 787 within "weeks". However, some analysts said that it may be some time before the regulators grant final approval for this. "Take whatever date is agreed upon and add three to six months to it," said Oliver Mcgee, a former US deputy assistant secretary of transportation. "I don't think that you are going to see any type of quick fix or compromising on the FAA side." However, Mark Rosenker, former chairman of the NTSB, added that Boeing was working to ensure that its redesign improved the battery's safety. "They don't want to put an airplane up that they're going to have to deal with again," he said. "They want this thing resolved. They want to do it in an efficient, appropriate, scientific, analytic way. It is not in their best interests to rush a system."